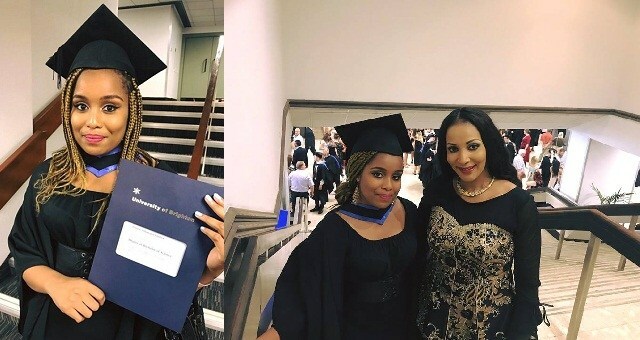 Chineme Ojukwu, daughter of late Biafran warlord, Chief Chukwuemeka Odumegwu-Ojukwu has graduated in style from the University of Brighton in England. She bagged a second class upper degree from Business Administration at the UK university. “My dear friends, Thank God with me. Abuzi kwam ‘nne a graduate’. My beloved daughter Chi has just graduated from the University of Brighton with a 2:1 in Business Administration. I thank Almighty God for blessing me with a daughter who has literally been like a mother to me. I call her Nne m o. This would have been a very proud moment also for her daddy. He used to call her ’Daddys secretary’ or ‘secretary gburugburu’ because as a child She loved to spend her afternoons after school with him in his office, playing with papers on the floor. How time flies! It was a splendid ceremony and much anticipated family reunion.